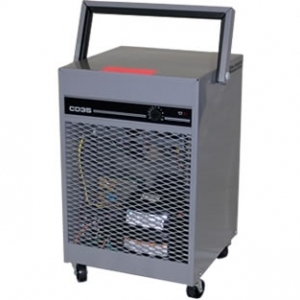 The Ebac CD35 is a no-nonsense, go-anywhere, portable dehumidifier. Rugged enough for industry shops and storerooms, efficient enough to dry sensitive computer centers or archival storage, attractive enough to serve in a home den, basement or garage, yet reliable enough to withstand the abuse of the rental environment or a steamy locker room. It's self-contained and automatic. Simplicity of operation. Standard 110 v. plugs in anywhere. Sturdy carrying handle and wheels for easy mobility. Extra long power cord (25'). Facility for permanent drainage with a convenient drain point. Quick disconnect to reduce setup and dismantling time. National Trade Supply, LLC is one of the largest EBAC Dealers in the United States. We stock many of the EBAC products and accessories in our own facility providing you with a quicker turnaround time and instant tracking information on your order. We have installed EBAC units in a variety of applications and can offer expert advice on how to properly install yours. We are also an authorized service center for EBAC products and can offer warranty service and replacement parts.